I've griped about the lack of great drugstore polish a lot lately. I think in recent years the best selection of drugstore nail polishes I have found has been at Rite Aid. The problem is, I don't have a Rite Aid in Florida. I had all my Rite Aid adventures in California last year. I'd have to say my favorite drugstore polish brand of all time is JulieG which is only carried at Rite Aid. I can't even. The good news is that you can purchase the JulieG brand online, but that does take all the shopping fun out if it sadly. This was one of the colors I picked up last year that I recently re discovered it's greatness! Color: I need more blues like this in my life. 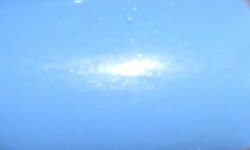 The aqua light blues really get done a lot in nail polish, but I prefer more of the light blues like this. This is a great color. It's pigmented, soft, and just pops against your nails. There is a teensy bit of shimmer in this that is visible in the bottle, but I can't really see it on the nail at all. Formula: I love JulieG formulas. They're are smooth, easy to apply, self level, and just my favorite formulas when it comes to drugstore polish. This polish did not disappoint. Price: This is $3.99 and can be found on the Jesse's Girl website. Overall: I love Santorini. This is a definite staple in my nail polish collection. It's a color that every nail polish lover should have and it's just all around great polish.